I am grateful to Paul Kruger, PGA Professional at The Canyon Club, Albuquerque, New Mexico, for giving me permission to use his content for this week’s blog, which is very relevant to those of us in the Northern Hemisphere who are currently experiencing the annual problem of falling leaves on our golf courses. First and foremost, keep in mind that detached leaves are loose impediments, unless they are clinging to your ball, see Definition of Loose Impediments. Therefore, with leaves in the vicinity of your golf ball, you might want to leave (leaf!) well enough alone, unless you are familiar with such Rules as Rule 23 - Loose Impediments, Rule 12-1b - Searching for or Identifying Ball Covered by Loose Impediments in Hazard, and Rule 13-4c - Ball in Hazard; Prohibited Actions. On the putting green, you may remove leaves on your line of putt provided you do not press anything down, Rule 16-1a - Touching Line of Putt. Also on the putting green, per Rule 23-1, if you accidentally move your ball in the process of removing leaves, there is no penalty provided the movement of the ball is directly attributable to the removal of the leaves. Just remember to replace your ball to where it was before you caused it to move, otherwise you will incur a loss of hole penalty in match play or a two-stroke penalty in stroke play, Rule 18-2 - Ball at Rest Moved by Player, Partner, Caddie or Equipment. However, when the ball does not lie on the putting green, or in a hazard, you may remove leaves in the vicinity of your ball, provided you do not cause your ball to move. If you do cause your ball to move, you incur a one-stroke penalty and you must replace your ball, Rule 18-2. Leaves that have been piled for removal are ground under repair, Definition of Ground Under Repair. Those are the kinds of piles of leaves that you don’t have to worry about encountering outside of a water hazard, because relief without penalty is available to you via Rule 25 - Abnormal Ground Conditions, etc. In fact, if it is known or virtually certain that your ball is lost within such a pile, relief is provided by Rule 25-1c - Ball in Abnormal Ground Condition Not Found. In taking relief, you must determine the nearest point of relief to where the ball crossed the outermost limit of the pile of leaves and drop within one club-length of that point, not nearer the hole. If there is a pile of leaves immediately behind your ball in a hazard, be careful not to touch the leaves with your club prior to, or during, your backswing. Otherwise, you will incur a loss of hole penalty in match play or a two stroke penalty in stroke play, Rule 13-4c - Ball in Hazard; Prohibited Actions. 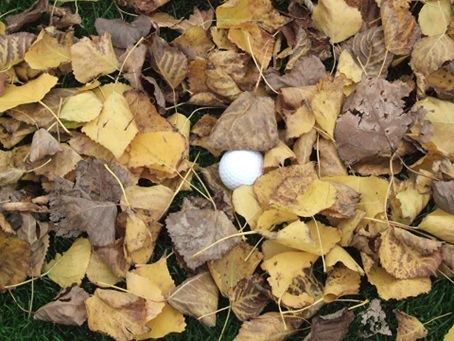 If you believe that your ball is covered by leaves in a hazard to the extent that you cannot find or identify it, you may, without penalty, touch or move the leaves in order to find or identify the ball. However, you must be extremely careful not to cause your ball to move in the process. See Rule 12-1b - Searching for or Identifying Ball Covered by Loose Impediments in Hazard. If you cause your ball to move during the search, you incur a one-stroke penalty under Rule 18-2 and you must replace your ball. If your ball was completely covered by leaves prior to the search, you must re-cover it with the leaves; but it is permitted to leave a small part of the ball visible. Thanks again to Paul Kruger, PGA, The Canyon Club, Albuquerque, New Mexico, USA for his permission to use his content in my blogs. My apologies to the few subscribers that feel that I promote my eDocuments too often. In my defence, there are material costs associated with maintaining the subscriber lists for my blogs and Rhodes Rules School emails and I can assure you that I do not profit from the amount of work that I put into assisting others to obtain a better understanding of the Rules of Golf. I am therefore grateful to all those that support me by making purchases at my Rhodes Rules School web site. Click here to purchase either of my eBooks, the original, '999 Questions' and the recently published, '999 More Questions on the Rules of Golf'.